All clinicians and technicians operating in the field of restorative dentistry struggle with creating treatment plans and ultimately restorations that blend harmoniously with nature. 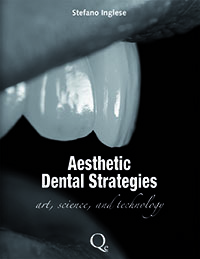 In his book Aesthetic Dental Strategies, Stefano Inglese shares his observations, insights, and techniques for doing just that. Mr. Inglese has spent his career studying with and learning from some of the best talents in dentistry. His curiosity of and for nature has allowed him the ability to understand the nuances that permit seamless integration of his restorations with nature. In the first part of the book, his focus is on the examination of the morphologic characteristics of teeth and their primary importance. Mr. Inglese reminds the reader that “one’s observation must not be limited to teeth as single entities but include their relationship with dental elements and anatomical structures around them: the gingival tissue, lips, face, personality and character of the patient." This careful analysis will allow the interdisciplinary team to establish parameters and formulate ideal aesthetic objectives. Additionally, an analysis of the dentogingival relationship between hard and soft tissue as well as the tooth-lip relationship, which are fundamental in phonation is necessary. Finally, it addresses the subject of the micro- and macrogeography of the tooth surface and how the effects of light reflection can change the appearance, size, and morphology of teeth. The second part of the book spotlights clinical cases which provide practical applications of the concepts previously described. Mr. Inglese also demonstrates his reproduction of dental forms, both on sample models and in real clinical cases. Specific use of materials and various techniques, depending on the complexity of the rehabilitation, are presented in depth. Throughout the book the author’s attention to detail and his analysis of all the elements in play gives the reader a true appreciation for his level of expertise. The outcomes realized in the clinical cases, given the challenges presented by the pre-op situations, were incredible and truly blended harmoniously – naturally. Mr. Inglese shares his restorative techniques in depth with excellent documentation and a stunning photo gallery. The reader must consider the ever-evolving material armamentarium when analyzing the authors choices. Even though this book is only a few years old, there now may exist better material alternatives than the ones utilized here. In conclusion, this book is a true reference for deliberate, predictable dentistry. It covers in depth, the fundamentals needed to analyze, treatment plan, and fabricate beautiful and natural restorations that will be life changing for our patients.